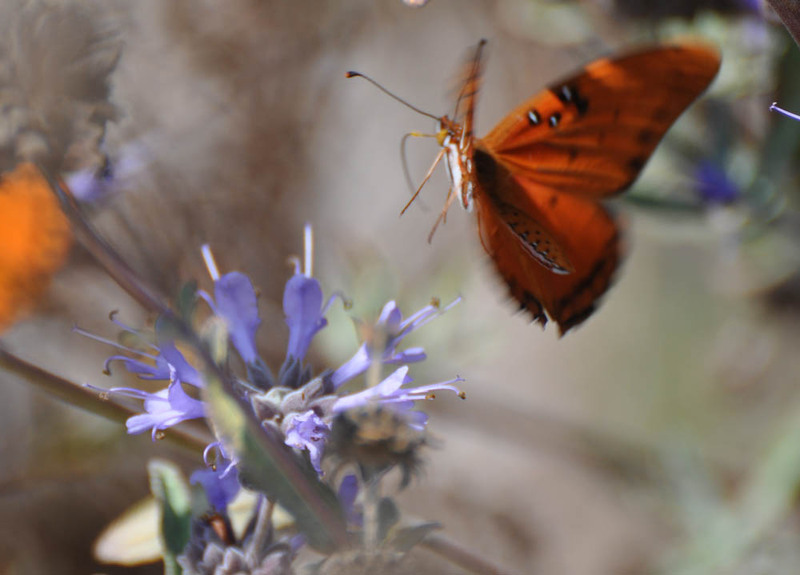 Bright orange butterflies are now flitting through many Southern California gardens. A bit smaller and brighter than the Monarchs, they seem particularly attracted to the pink and purple flowers in Mother Nature’s Backyard. These colorful visitors are the Gulf Fritillaries (Agraulis vanillae). 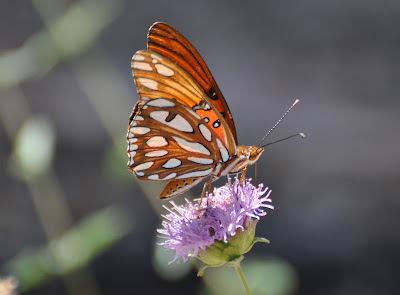 Gulf Fritillaries are medium-sized butterflies with a wingspan of 2.5-3.75 inches (6-9.5 cm). They are members of the Family Nymphalidae, the brush-foot butterflies, which includes such well-loved locals as the Monarch, Red Admiral and the Painted, West Coast and American Lady butterflies. While this large family is found world-wide, the brush-foots are most plentiful in the tropics. 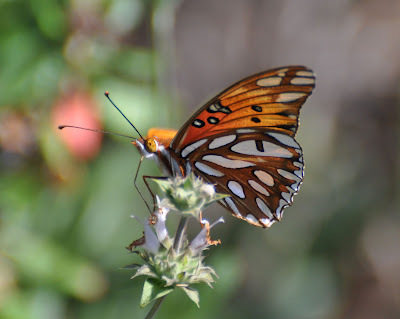 In fact, the Gulf Fritillary, itself, is best considered a tropical butterfly. The name ‘brush-foot’ refers to the front legs, which are short or rudimentary, hairy and not used for walking. North American brush-foot butterflies are often medium-sized, with showy colors or patterning, and rigid, clubbed antennae (knobs at the ends). The vein pattern of the forewings is also unique to this family. You can see all of these characteristics in the picture below. 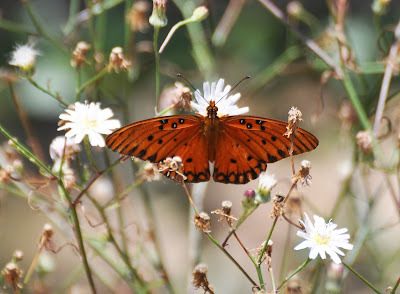 The Gulf Fritillary belongs to the sub-family Heliconiiae, the heliconians or long-wings. These, mostly tropical, butterflies have an elongated forewing and are often brightly colored in shades of orange and black. Their colors ‘announce’ that they are toxic; like the Monarchs, long-wing larvae feed primarily on poisonous tropical plants. The geographic distribution of the Gulf Fritillary, which feeds on Passion-vines, is limited by the availability of this larval food plant. While native to South and Central America, the West Indies and the American South, its range spread to California with the inclusion of Passion-vines in local gardens. The first recorded sighting in Southern California is from the 1870’s . Gulf Fritillaries are colorful and distinctive whether viewed from either the upper or lower side. Females are only slightly larger and less brightly colored than the males. In both sexes, the upper side is bright red-orange with prominent black veins on the elongated forewing. The patterns are very regular, symmetric and attractive. The border of orange circles (edged in black) on the hind wing resembles a lacy edging. There are also some symmetric, black and black-white dots on the upper side (see photo above). For more good photographs, see references 2 & 3 at the end of the post. The underside of these butterflies is even more enchanting. While not as bright, the underside sports distinctive shiny, translucent patches rimmed in black. These large blotches flash silver with motion, a distinctive feature visible even in flight. No other local garden butterfly has these large, silvery patches; they are the best identifying characteristic for the Gulf Fritillary. But that’s not all! This is truly a lovely and exotic butterfly when seen close-up. Closer observation reveals the intricate coloration of the body and unusual orange eyes with dark spots (above). Fortunately, Agraulis vanillae is fairly easy to photograph. It’s relatively large and slow-flying; and it perches and feeds regularly, making it a good subject for insect photography. For more tips on photographing butterflies see: http://mother-natures-backyard.blogspot.com/2015/07/life-friendly-gardening-photographing.html. The larvae (caterpillars) are also distinctive. 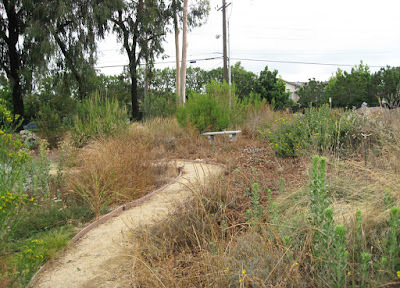 Since we’re a California native plant garden (sans non-native Passion Vines) we haven’t any photographs. But wonderful photos of the complete life cycle are available from the Rio Grande Valley Nature Site: http://www.thedauphins.net/id113.html. The larvae are orange and black striped, with rings of black spines around the body. You’ve likely seen them if you have the right Passion Vine in your yard. The larval coloration signals ‘don’t eat me – I’m poisonous’. 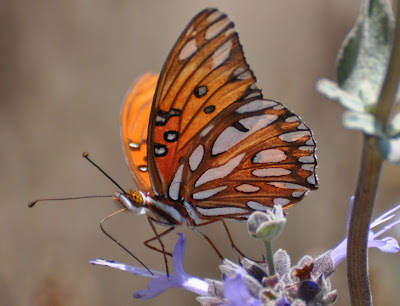 For more on Gulf Fritillaries, Passion vines and poisons see: http://bugoftheweek.com/blog/2015/2/23/beautiful-but-stinky-gulf-fritillary-iagraulis-vanillaei. Many adult Gulf Fritillaries live only a few weeks, although some will overwinter in warm locations. These older adults often look quite tattered by spring. Males can be seen cruising the garden, searching for females, most months of the year in western Los Angeles County. 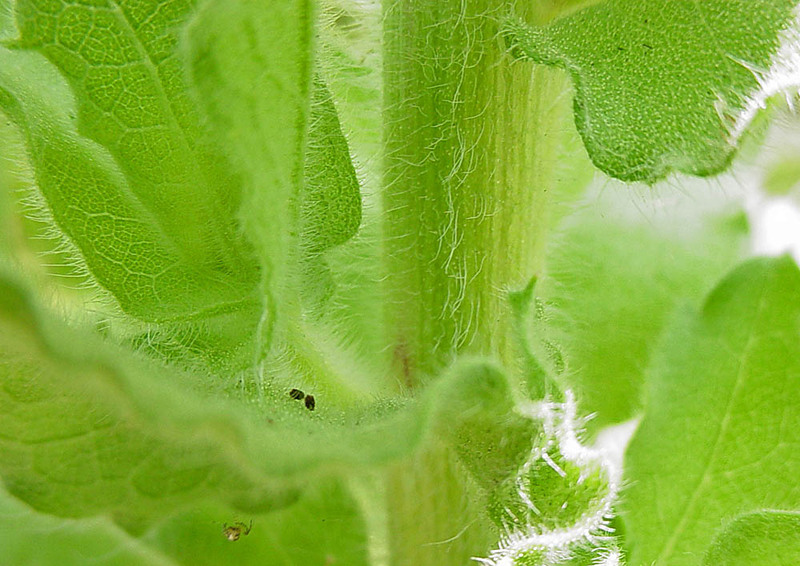 Females lay their mound-shaped eggs on the larval food plants. Gulf Fritillary caterpillars eat several species of Passion Vines (Passaflora species) including Passiflora incarnata (Purple passionvine or maypops; native to Eastern U.S) and P. foetida (Stinking passionflower, Corona de Cristo or Running pop; native to tropical Americas). 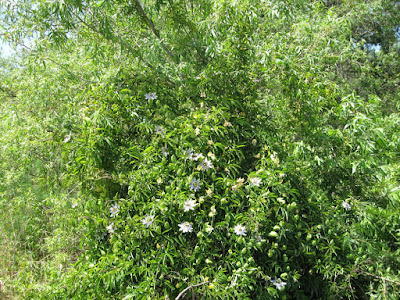 Both of these plants can be invasive; in fact, the Purple passionvine is a serious invasive pest plant in the Gardena Willows Wetland Preserve. 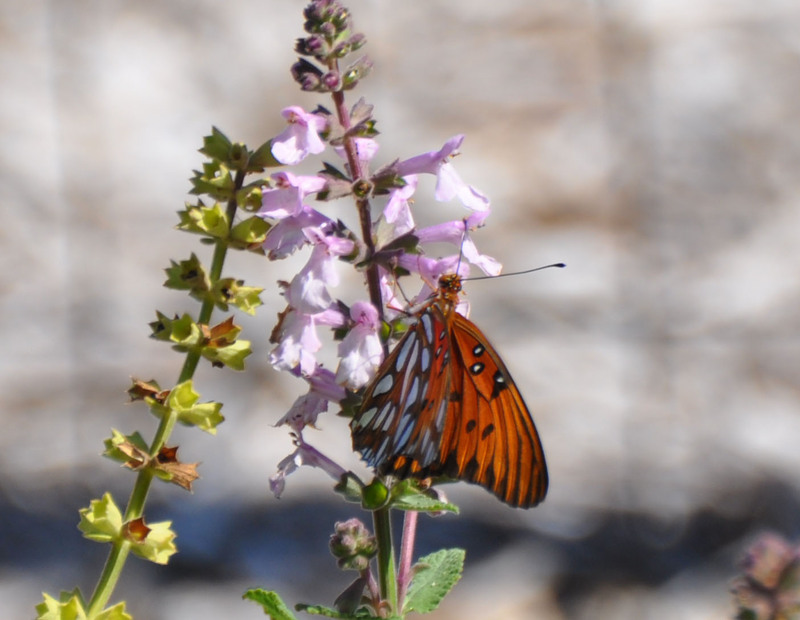 So while Passion Vines attract Gulf Fritillaries, we have a love-hate relationship with them in our Preserve. We’ve been known to call it ‘Hate it with a Passion Vine’ as we work to remove it! The Agraulis vanillae chrysalis (cocoon) looks like a dried leaf hanging from the vine. This is another great example of the ways in which butterflies have evolved multiple mechanisms (toxic chemicals; mimicry and camouflage) to insure survival of the species. See references 2 & 3 for good chrysalis pictures. Adult Gulf Fritillaries nectar on a variety of native and non-native plants. In Mother Nature’s Backyard, they tend to favor purple-flowered species in the Mint family including Coyote Mint (Monardella villosa), the Woodmints (Stachys species) and the native sages (Salvia species). Of course they flock to tropical flowers like the popular Mexican sunflowers (Tithonia species) and the Lantanas. They also frequent native and non-native plants in the Sunflower family. In their native range, Gulf Fritillaries live in open areas like fields or openings in the tropical forests. 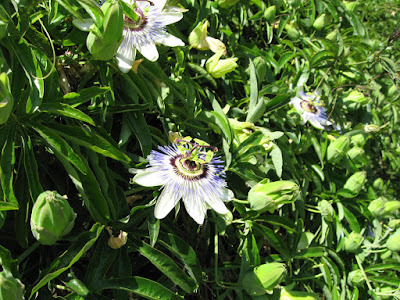 Here in California, you’ll see them in urban/suburban gardens or areas near gardens with Passion vines. 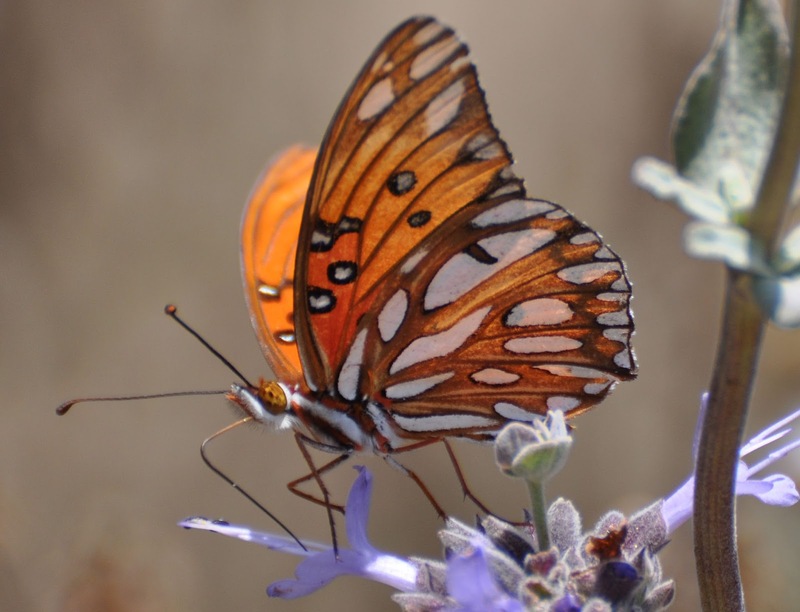 Growers raise Gulf Fritillaries for sale and they are released for weddings and other celebrations . This has likely helped increase their numbers in recent years. 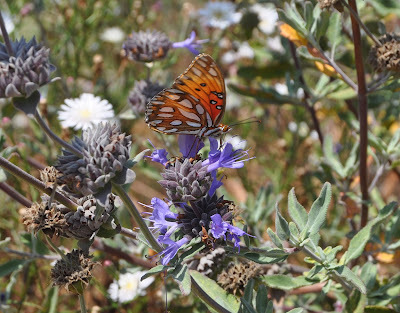 In fact, they are a very common butterfly in Southern California and not endangered anywhere in their range. We hope you enjoy watching these pretty butterflies as much as we do. 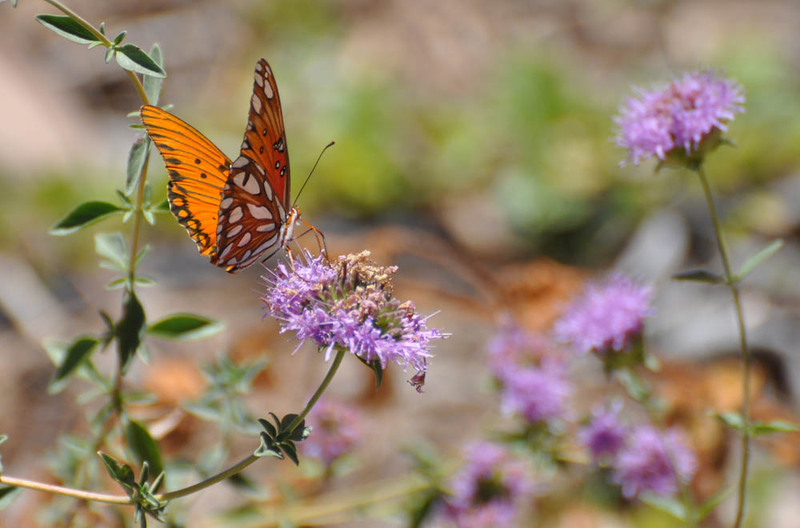 But don’t feel you need to plant a Passion vine – the abundance of Gulf Fritillaries in most neighborhoods is a clear indication that we have enough Passion vines already! Sustainable gardening in Southern California means coping with highly variable precipitation. This month, we’re continuing to manage the effects of an epic four-year drought. And now scientists are cautiously predicting an El Niño winter, with higher than average amounts of rainfall. Yup, that’s gardening in our capricious mediterranean climate! The U.S. 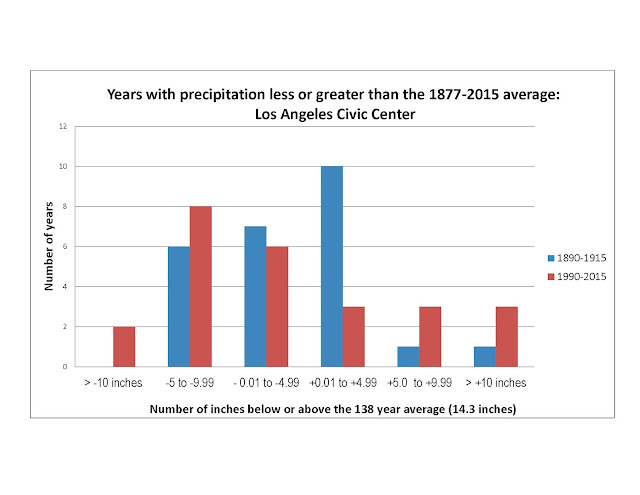 Weather Service has official precipitation records for the L.A. Civic Center going back to the 1877-78 season (the water year runs from July 1-June 30) . Since then, the average yearly rainfall is 14.93 inches [1, 2]. During the 138 year period, extreme precipitation years (both high and low) have become more common. The graph above shows the number of years below and above the average for two 25-year periods: 1890-1915 and 1990-2015. One thing is clear: there are more ‘extreme precipitation’ years (both below and above average) in the current period. The last 25 years had 10 years with a deficit of at least 5 inches. This compares to 6 such years in the earlier period. But there were also 6 years with 5 or more inches over the average (compared to two from 1890-1915). So we need to prepare not only for more ‘drought’ years, but also for more ‘wet’ ones. 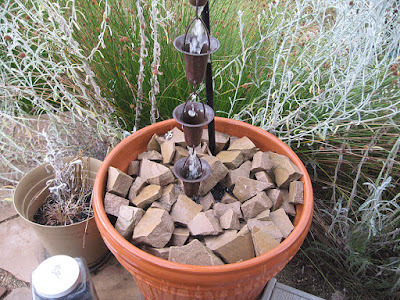 We gave you some tips for surviving the drought (http://mother-natures-backyard.blogspot.com/2015/07/surviving-drought.html) and summer planning last month: http://mother-natures-backyard.blogspot.com/2015/07/summer-time-for-garden-planning.html. This month we suggest ways to prepare for this winter’s rains - El Niño or not. First, a word of caution. Mother Nature’s Backyard is situated in the flat lowlands of the Los Angeles Basin. Our advice is most applicable to gardeners in similar areas. If you live in the foothills, and particularly if you live along a creek, in areas below recent burns, or those prone to landslides, you may need to take additional precautions. Consult your local municipality for advice on preparing for an El Niño winter. Recent ocean temperatures indicate that this may be a very wet winter. Prepare now if you live in a flood-prone area! 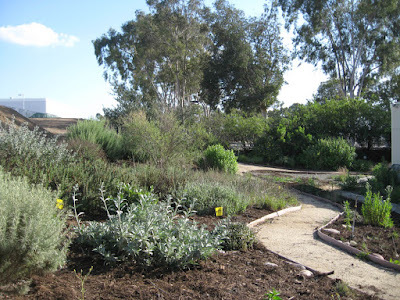 The rest of us still have several months to make our gardens both more water-wise and more El Niño proof. Some of the suggestions below may not be applicable. But we hope you’ll adapt some for use in your garden – and get moving on making them happen. The time is now to prepare for the winter rains. 1. Consider decreasing the area covered with impervious materials. Traditional walkways, driveways, concrete or mortared patios all are impervious surfaces. Water runs off them and, very often, into the storm drains and out to the ocean. That’s one reason why urban areas like the Los Angeles basin need such extensive storm drain systems. El Niño years can be tricky. Whether they bring deluges or persistent showers, excess water can become a challenge for local gardens. Fortunately, you can take several steps to prevent/decrease the effects of running or standing water in your garden. One strategy is to increase the percentage of the yard that can infiltrate rain water. This allows more water to infiltrate in place, rather than aggregate in ponds or rivulets. We discuss several infiltration options below (see suggestions 2 & 3). Another idea is to simply convert impermeable surfaces to permeable ones. This helps control excess rain water and also increases the amount of irrigation water available to plants (by decreasing summer run-off). 2. 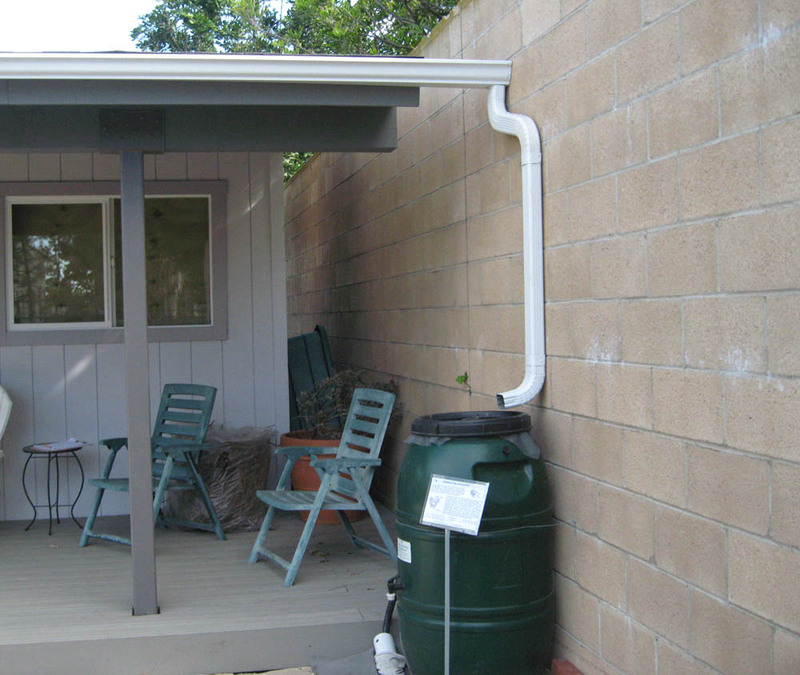 Use the rainwater that falls on your roof. Your roof is a large rain collector. Does the water from your roof end up in the storm drains? Does it make a muddy mess around your house, threatening the health of your foundation? If so, now is the time to install gutters and harvest rain from your roof. 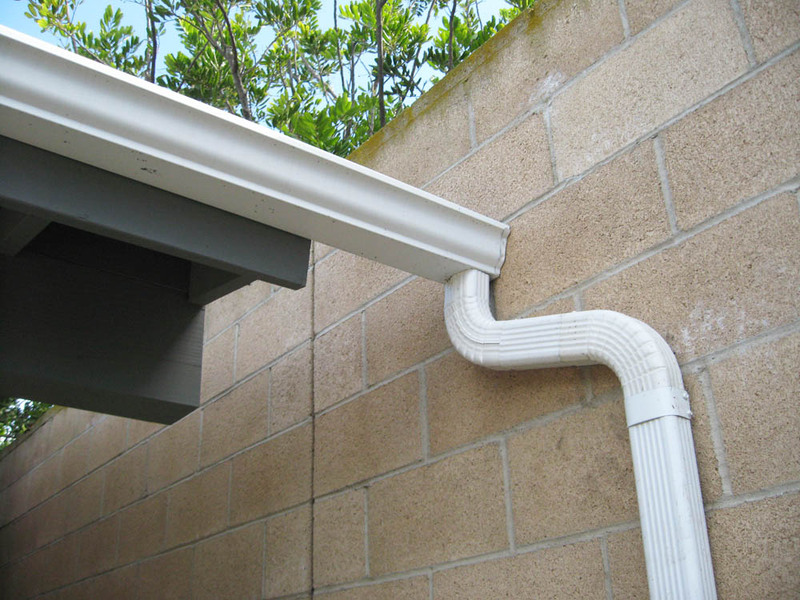 The advantage of gutters is that they let you direct the water collected by your roof. You can then store the water (see #4, below) or direct it to places where it can be infiltrated into the ground (#3, below). For more information on rain gutters see: http://mother-natures-backyard.blogspot.com/2013/02/harvesting-rain-gutters-downspouts-and.html. 3. 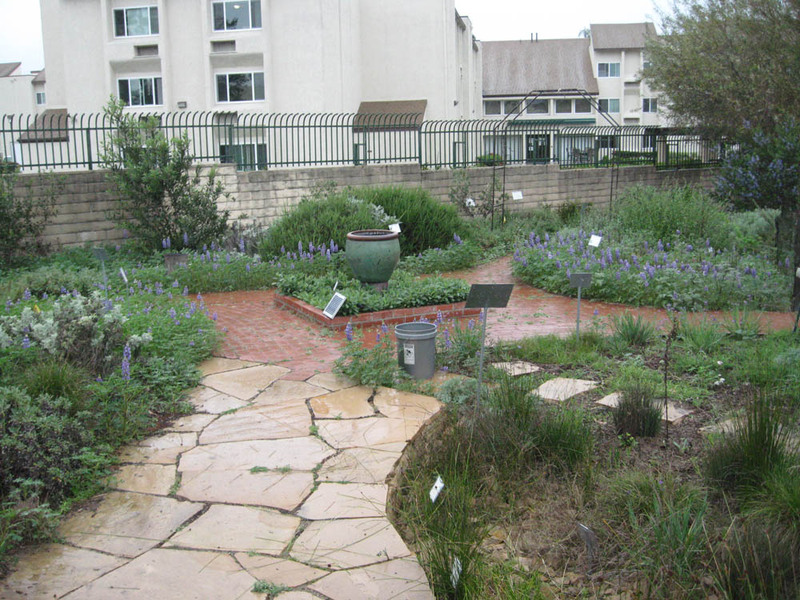 Infiltrate more water into the ground using a rain garden, dry well or dry swale. Water from impermeable surfaces must go somewhere. In the past, most of it has ended up in the ocean. But each year, more California gardeners are installing simple infiltration ‘devices’ in their gardens. While getting rid of one problem (excess runoff), these devices also solve another: providing deep water resources for trees and shrubs. They allow water to infiltrate into the ground, replenishing the ground water. Trees, shrubs and other long-rooted plants can then access this ground water well into summer. If you have an area where rain water puddles, you may want to consider a simple infiltration device like a dry well. These take little space, are relatively easy to install, and often solve the puddling issue admirably. They can be used in unplanted areas, making them a good option for patios and utility areas covered in gravel mulch. See the links below for more information. Rain gardens and infiltration swales are the perfect complement to rain gutters, infiltrating the water from a roof. While no two rain gardens or dry swales are the same, they all slow or store water briefly, allowing it to percolate into the ground. They can be planted or not; they can be disguised as a natural-looking dry creek. Some are used as seating or play areas in the dry season. And they allow you to use plants that like a little extra winter water, even if the rest of your garden is quite water-wise. 4. Consider storing some water. People in dry climates around the world store rainwater for use in dry periods. The regulations on rain water collection/storage are changing, so check your local municipality to learn what is legal. 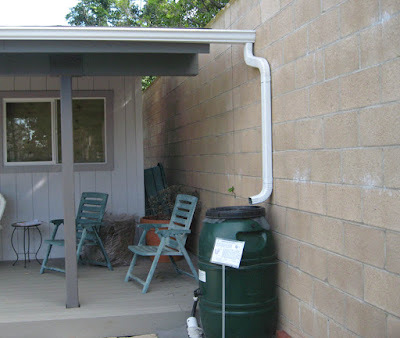 Nearly all S. California municipalities permit you to store water in rain barrels, to be used for watering your garden (not for drinking). As water becomes more scarce (and costly) it’s silly to not take full advantage of the rain that falls on your property. California law is now clear – you own that water! Don’t let it slip away. Act now to use your clean, free rain water this winter. 5. Use the ‘high’ and ‘low’ spots in the garden to best advantage. Sandy soils dry out quickly in summer; clay soils tend to hold water, creating wet spots in winter. Most gardens have areas that are ‘high and dry’ and others that are low and moist. If not, it’s relatively easy to create a bit of garden topography with low berms (artful mounds) and shallow swales. Whether your soil drains quickly, slowly, or somewhere in between, creating modest garden topography has several advantages. First, a planted berm is often an excellent way screen short, unsightly views (for example to block views of parked vehicles). Berms and swales can also be used to direct and infiltrate rain water. And they add interest to a flat garden. Another benefit of berms and swales is that they allow you to grow plants with water requirements slightly different from those available in the rest of your garden. 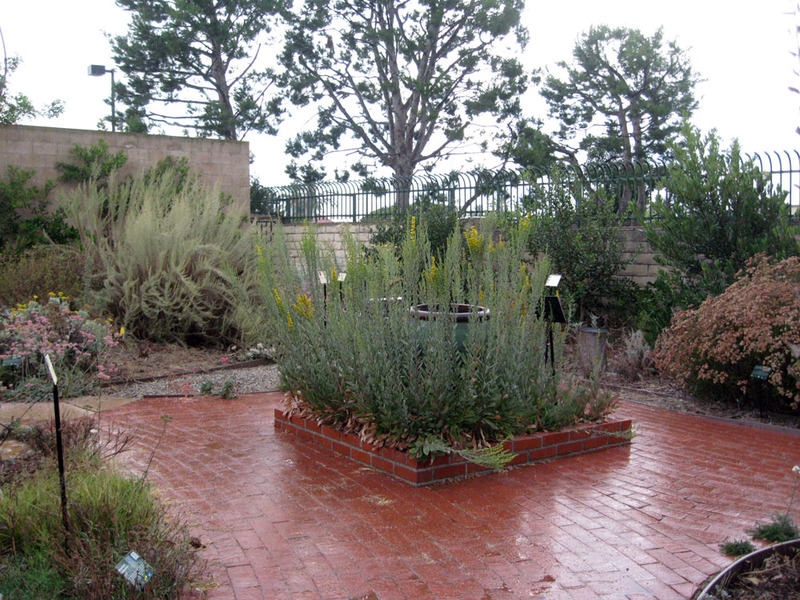 For example, plants that hate wet feet can be grown at the top of a berm (driest place). 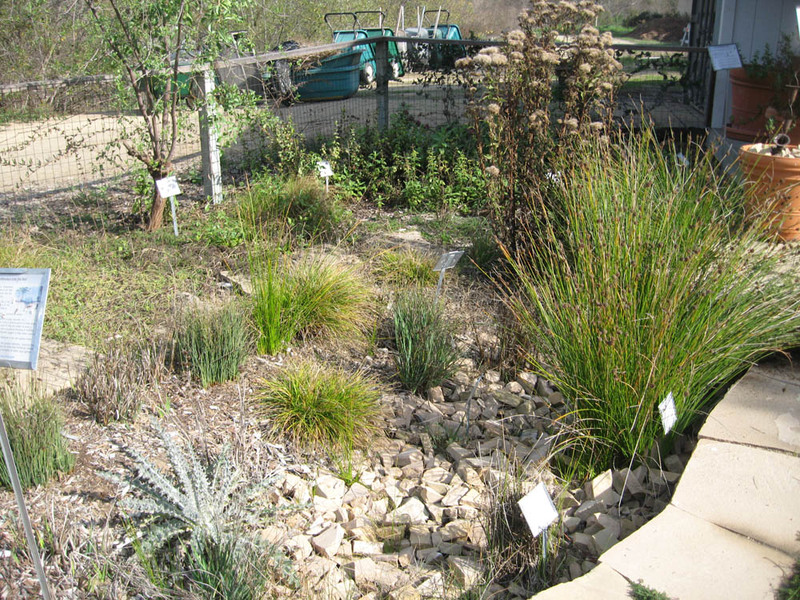 Plants that like a little extra water often do well at the bottom of a slope or swale. For more on creating garden topography see: http://mother-natures-backyard.blogspot.com/2012/12/getting-to-know-your-gardens-soil.html. 8. 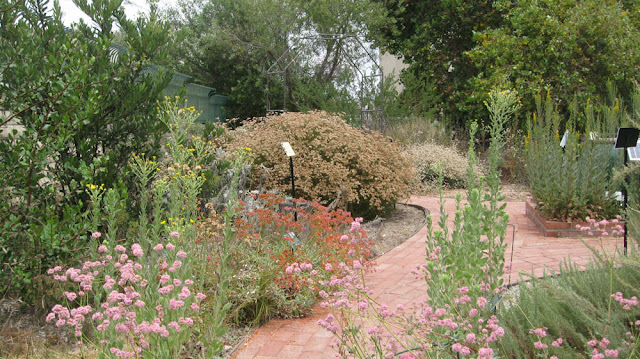 Choose trees, shrubs and vines that can take both drought and excess rain. Global climate change makes planning for the future a bit more challenging. We’re already seeing some effects: hotter temperatures overall; more temperature and precipitation extremes; changes in the timing of the seasons. The recent drought is just a taste of things to come. Trees, vines and large shrubs are an excellent way to provide shade. In fact, all local gardeners should be planting now for future shade. With planning and proper care, large shade plants can live for many years. But choosing the best adapted plants is something we’re just beginning to grapple with. In Southern California, our best choices will need to withstand both the periodic droughts and periods of greater precipitation. Only certain plants are so adapted. California native trees and shrubs are better candidates than those from the tropics or other regions with plenty of precipitation. But what native trees and shrubs will be able to take both the heat and the precipitation extremes? We have some ideas and will discuss that topic next month (September, 2015). 9. Take advantage of winter rains for planting. 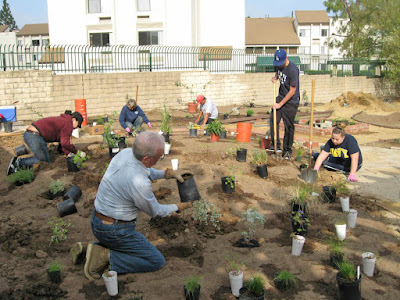 Winter is the easiest time to plant in lowland Southern California. Soils are well-moistened and the temperatures cooler. That’s why California native gardens are traditionally planted in late fall or winter. Winter is not only the easiest time to plant, but it’s also the best for plant health. 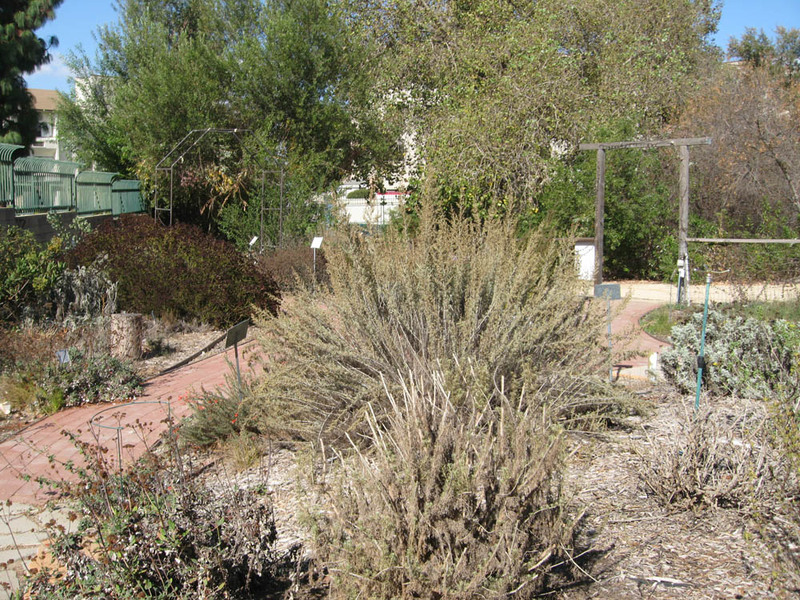 California native plants are adapted to our seasonal weather patterns. Many are dormant (or at least slow growing) by late summer or fall; they are primed to grow with the winter/spring rains. Plant them in late fall/winter and they will establish themselves right on schedule. But plant California native plants in summer and they’ll be ‘seasonally confused’; the heat says ‘it’s time to go dormant’ while the irrigation water says ‘it’s time to grow’. In fact, summer planting is difficult not only for the plants, but also for the gardener. Planting with the rains is yet another example of working with Mother Nature. Gardening elders have learned – often through painful experience - that working with Mother Nature is better than trying to work against her! An El Niño year can be an excellent opportunity to start a new garden – or plant trees and large shrubs. So do your summer planning now. Figure out what plants you need. Plan to buy required plants at the fall plant sales, and plant them with the winter rains. 10. Enjoy today’s weather, whatever it may be. The news on climate change can be downright depressing. The best antidote is to sit in your garden. Enjoy the hot, dry days of late summer. 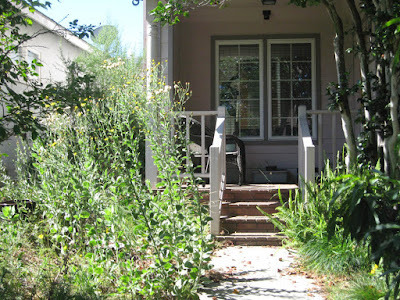 Watch the abundant life that enlivens California gardens this time of year. Enjoy the balmy evenings – and vow to plant more silvery-colored shrubs to enhance your twilight garden. Look forward to the cool rains. Sit out in your covered patio and smell the rain. 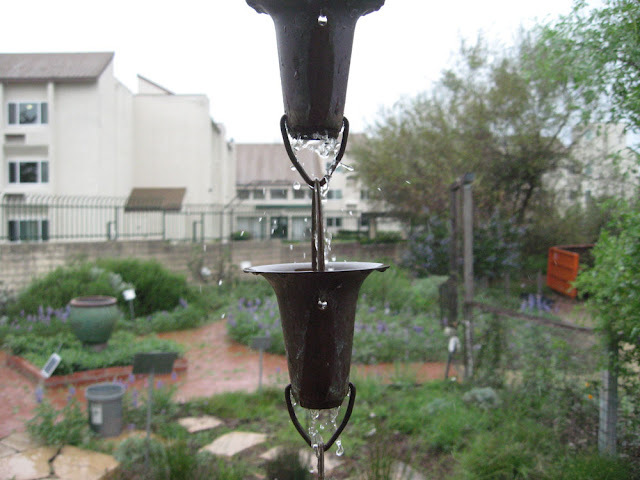 Listen to the sounds of a rainy day in your garden. Watch the birds and other creatures – what are they doing on a rainy day? Put your potted plants out to benefit from the good, pure water. Those of us in California are blessed with a wonderful climate, with seasons that promise beauty and interest every month of the year (http://mother-natures-backyard.blogspot.com/2014/09/seasons-in-southern-california-garden.html). But where ever you may garden, there’s something wonderful in your garden right now. So, enjoy today’s weather – whatever it may be. Early August and it’s full-on summer in the garden. Most of our annual wildflowers are long gone. But several local sunflowers add their cheery notes from now into fall. One of these is the Telegraph plant, Heterotheca grandiflora. Telegraph plant is an annual or short-lived perennial native to Southern California and Northern Mexico. It’s part of many plant communities including Coastal Strand & Bluffs, Coastal Prairie, Coastal Sage Scrub, Chaparral and even Southern Oak Woodland. 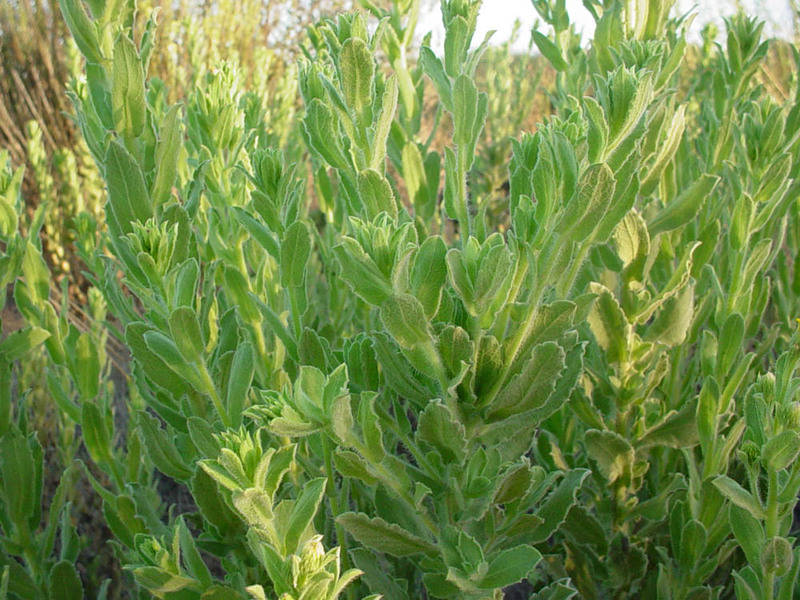 Telegraph plant commonly grows on bare, sandy soils at elevations less than 3000 ft (1000 m). It has been introduced to Utah, Nevada, Hawaii and even Australia (where it’s become an invasive weed). 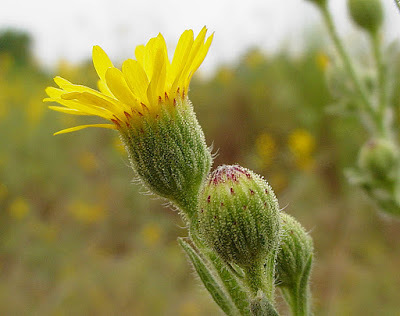 Also known as Sticky daisy and Telegraph weed, Heterotheca grandiflora is common in vacant lots, along roadways and on other bare ground throughout lowland Southern California. 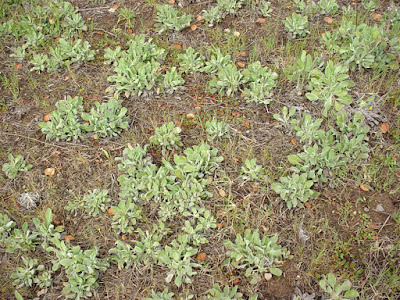 The name ‘Telegraph Weed’ hints at this plant’s propensity to spread, which it certainly does (see below). 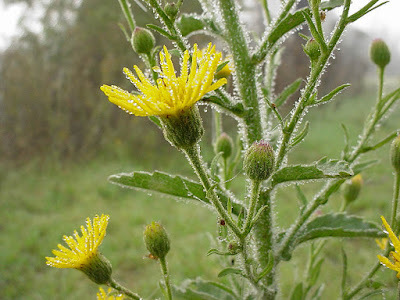 Some native plant experts argue that ‘weed’ should not be used for plants native to an area. The term ‘weed’ refers to a ‘plant in the wrong place’. And ‘weed’ has been used to denigrate significant native plants that have the misfortune to be deemed ‘not showy’. We, ourselves, prefer ‘Telegraph plant’ to ‘Telegraph weed’; it is both more respectful and more contemporary. The origin of the ‘Telegraph’ is lost in history. It may refer to the tall, straight stems (that resemble telegraph poles) or the spread of the plants (like a line of telegraph poles spreading across the landscape). Others point to the strong, creosote-like scent – not unlike that of old-time telegraph poles. All are feasible explanations for the unusual common name. 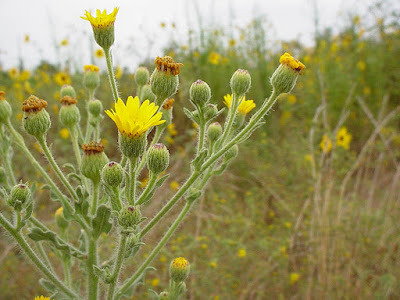 Older sources sometimes refer to Telegraph plant as Heterotheca floribunda. In fact, the name ‘floribunda’ (abundant flowers) is arguably a better descriptor than ‘grandiflora’ (‘large-flowered’). Many a student has scratched his/her head over this plant being called ‘large-flowered’! 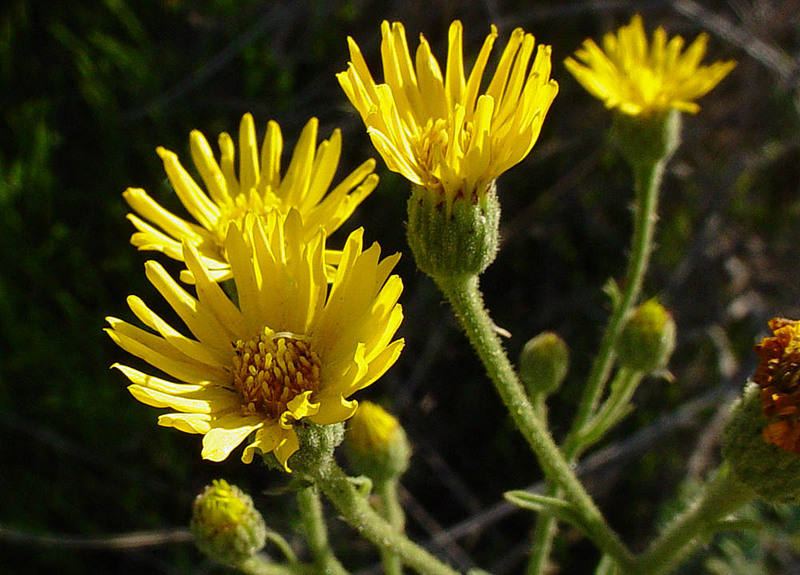 Seven species of Heterotheca are native to California. 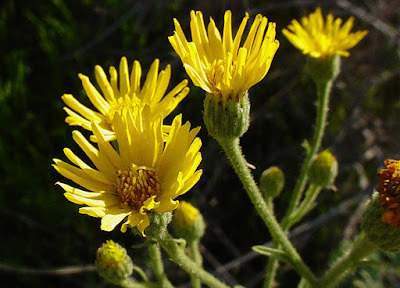 In addition to Telegraph plant, False goldenaster (Heterotheca sessiliflora), Camphor weed (Heterotheca subaxillaris) and Hairy false goldenaster (Heterotheca villosa) are native to Los Angeles County (the latter three usually in the foothills of local mountain ranges). The Heterothecas are members of the Sunflower family (Asteraceae). They share several traits with other sunflowers, including composite flower heads, wind-distributed seeds, aromatic foliage, importance as pollinator habitat and medicinal value. Telegraph plant can be an annual, biennial or short-lived perennial depending on local conditions. It dies back to the ground in the fall after blooming. In the garden, it’s often treated as an annual, with plants removed entirely each fall. 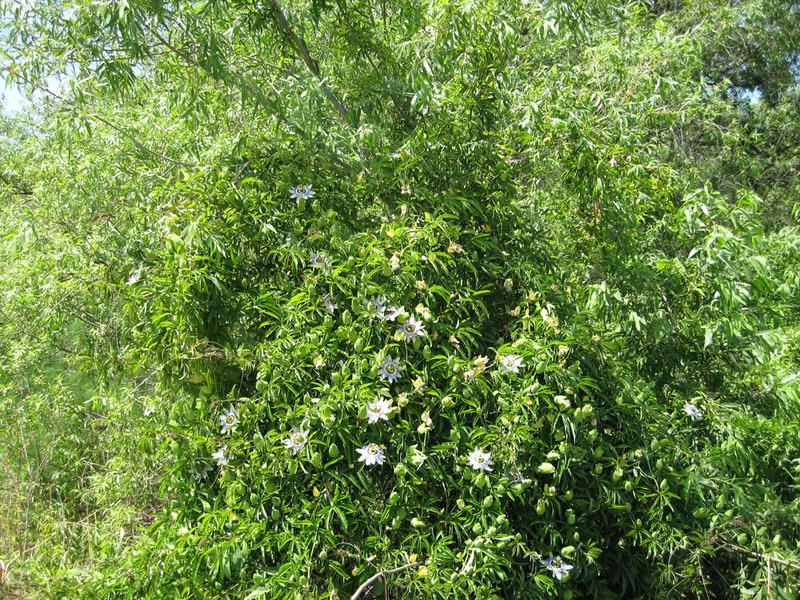 Telegraph plant has a single stout, erect stem, 3-6 ft (0.5-1.5 m.) tall, with side branches primarily at the top (see above). In fact, it looks a bit top-heavy. Older plants may have several, shorter stems and bloom earlier. 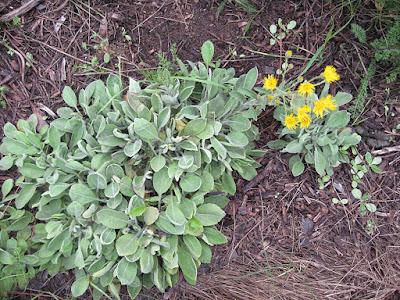 The leaves are medium to pale green, succulent, oval to lance-like, and may have coarse margin teeth. 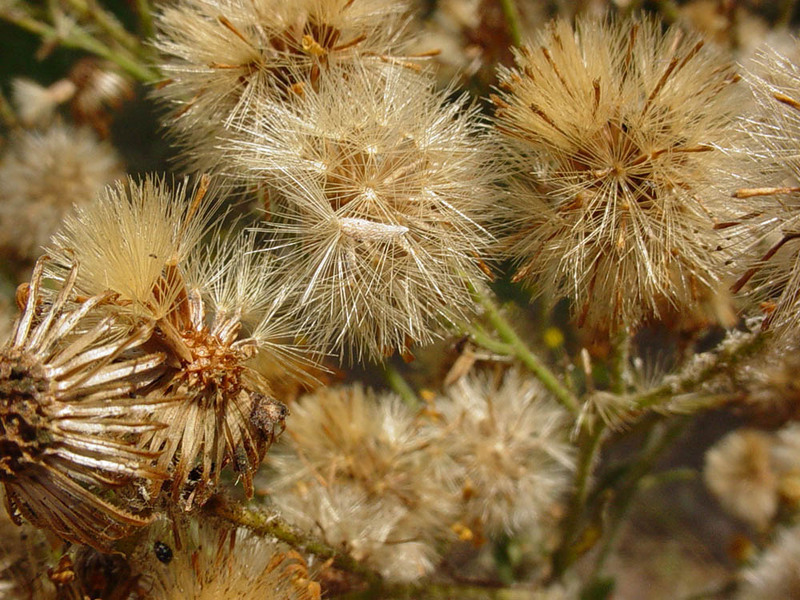 The foliage is densely pubescent (see below) with thin, transparent hairs. You can also see the resin glands in the photograph (they look like small dots on the stem and leaves) These glands are actually specialized trichomes (hairs) that produce and release secretions. Heterotheca grandiflora is one of our ‘stickiest’ natives, with a strong aroma all its own. The sticky aromatic chemicals – and the hairs - deter herbivory, protecting the young leaves and late blooms. Some of the chemicals likely function as growth inhibitors for other seedlings (allelopathic chemicals). Wear gloves when handling Telegraph plant or your hands will retain the distinctive, camphor-like scent for hours! Really!! The photograph above shows another advantage to being hairy. The dense hairs capture moisture from fog or drizzle, providing natural ‘drip irrigation’ to the plant. It’s an ingenious adaptation found in California natives from regions with periodic fog. In some years, the water captured from fog is the difference between life and death for such plants. The flowers of Heterotheca grandiflora are clustered in yellow sunflower ‘heads’ at the top of the plant. Both the ray flowers (the flat, strap-like flowers) and the inner disk flowers are bright yellow-gold. Each head has 25-40 slender ray flowers and 30-75 small disk flowers in the center. The flower color contrasts beautifully with the foliage. 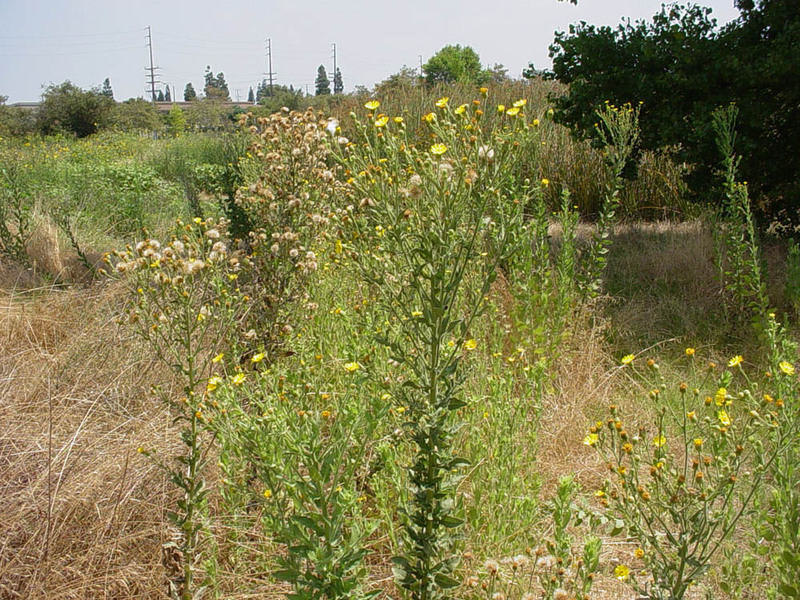 Telegraph plant can bloom nearly any month of the year in western Los Angeles County. But the main flowering season is late spring through fall. Flowers open over a long time – as much as 4 weeks – providing bright color and nectar. The plants are visited by a wide range of pollinators including native bees, flower flies, butterflies and flower moths. In fact, Heterotheca grandiflora is a recommended pollinator plant for Southern California gardens. Finches also love the seeds. 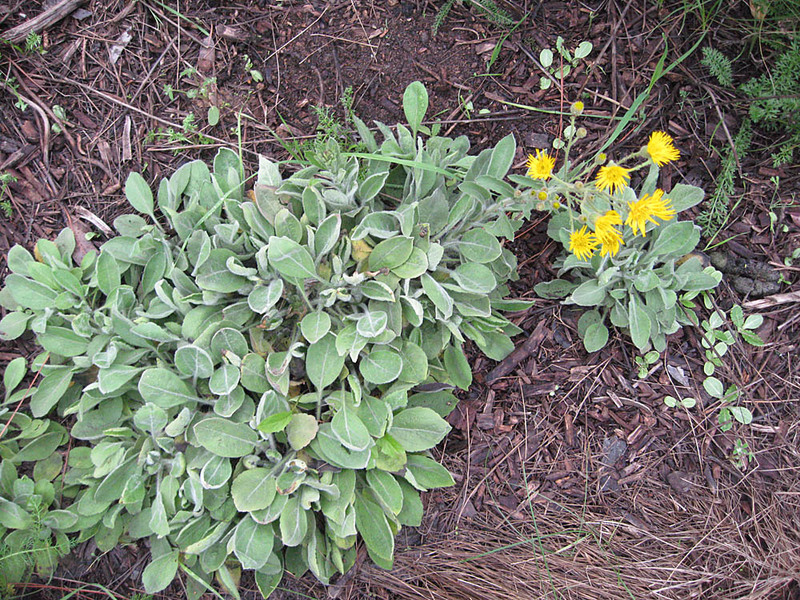 Telegraph plant is easy to grow (unless your entire garden is covered in thick mulch). Like many wildflowers, Heterotheca grandiflora likes full sun to part-shade. It needs adequate soil moisture until it begins to flower; but in most years can get by on seasonal rains. It forms an impressive root for a short-lived plant. We’ve grown it in sandy & clay soils with equal success. Like many local wildflowers, Telegraph plant is truly undemanding. Collect dry seeds in summer/fall and save until the winter rains. Or allow plants to re-seed naturally; once established, Telegraph plant will re-seed year after year. 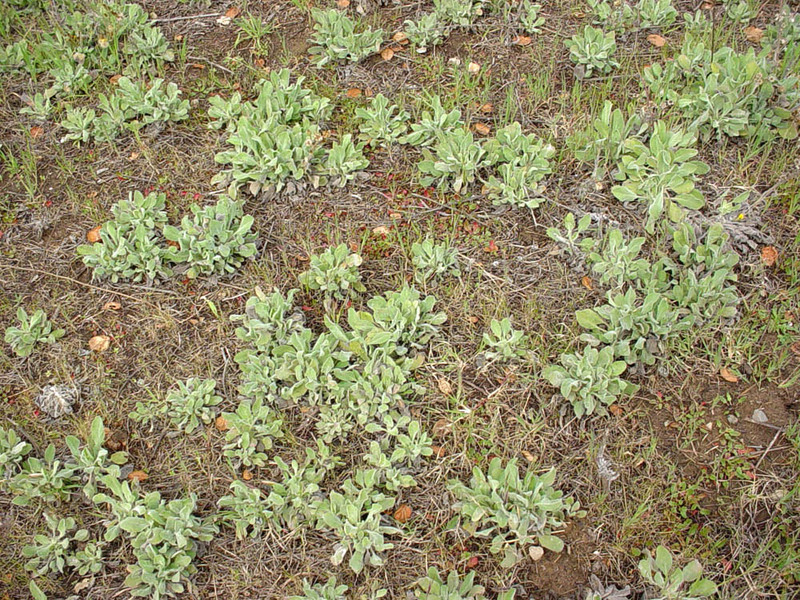 The seedlings are pale green and fuzzy – easy to distinguish from other seedlings in the spring. Simply pull up small, unwanted seedlings when the ground is moist. You can also start seedlings in paper cups and transplant out in spring. The seeds are small, so barely cover with soil. We simply let Telegraph plant naturalize in Mother Nature’s Backyard. It provides summer and fall color, and its tall, distinctive stems provide vertical interest. If used in a mixed flower bed, plant mid- to back-bed, depending on the height of other plants. Because it’s a late-bloomer, we find Telegraph plant indispensible for pollinator, butterfly and bird habitat gardens. It is well-matched to the needs of our local wildlife. Gardens featuring local native plants should also consider this common wildflower. Telegraph plant also has medicinal properties - not surprising for a plant with such a strong aroma. Heterotheca grandiflora produces chemicals (sesquiterpenes and others) that have both antibacterial and antifungal properties. A decoction or tincture of the foliage makes a useful cleansing wash for cuts, scrapes and minor skin wounds. 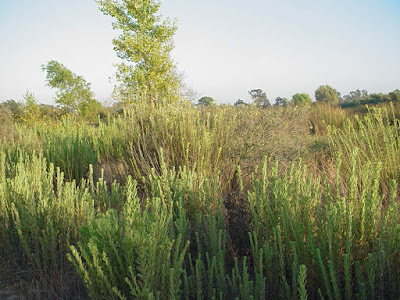 Related California Heterothecas produce anti-inflammatory chemicals. This likely explains the use of a salve or tincture of Telegraph plant as a topical lotion on sprains, arthritic joints and other joint problems associated with swelling, inflammation and associated pain. We've made and used a Telegraph plant tincture as a topical treatment for joint pains. It is quick-acting, long-lasting and amazingly effective! In summary, Telegraph plant is a local native wildflower that’s not used enough in local gardens. Its summer/fall blooms, habitat value and medicinal properties make it both interesting and useful. The foliage can be used to make gold and yellow natural dyes. And little finches eating the seeds are a sight to behold. We hope you’ll collect some seeds this summer and scatter them in your garden.